Though most never think of it, time is a complicated thing for computers. If the time is not correct, there are a lot of things that can go wrong and a lot of things that just don't work. 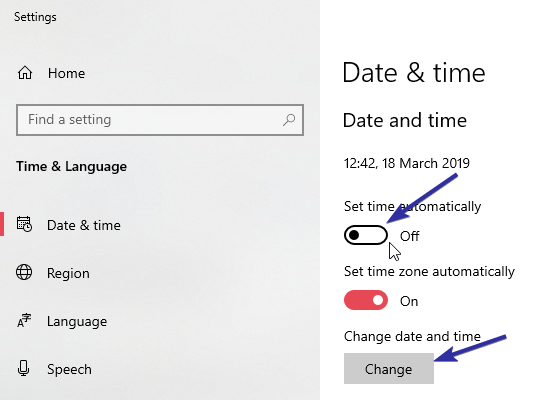 If your Windows system is showing wrong time for whatever reason, here are some simple yet effective steps you can follow to fix the wrong time issue as soon as possible in Windows 10. Before following the below steps, restart your system. Oftentimes, a simple restart will fix a lot of problems, including incorrect time. Also, the below discussed fixes will work on Windows 7 and Windows 8 too. 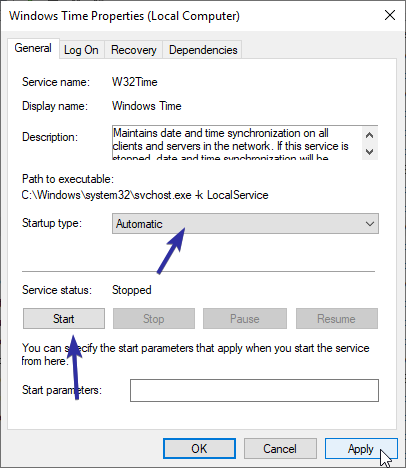 The first and foremost thing you should do is check if the Windows time service is running. If the time service is not running or stopped, Windows may show the wrong time as it cannot update it accurately. 1. First, press Win + R, type services.msc and click on the "Ok" button. You can also search for the same in the start menu. 2. 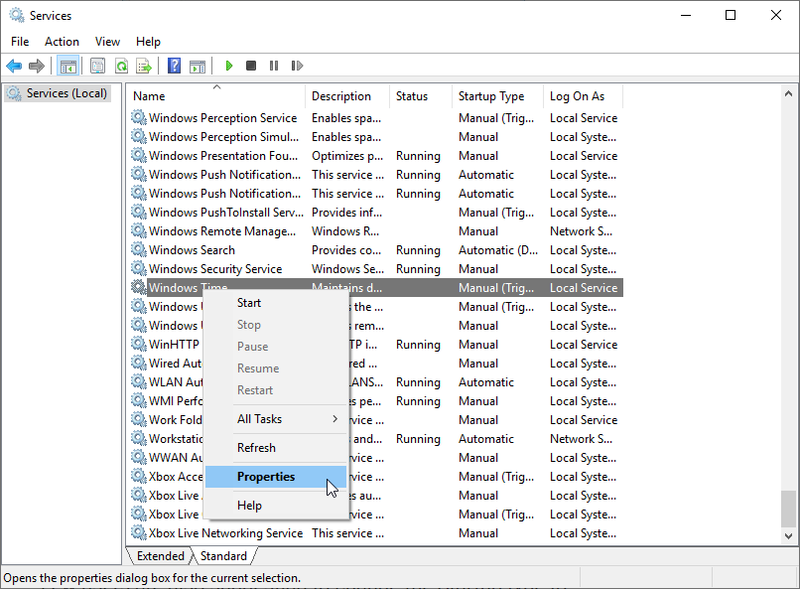 In the Services window, scroll all the way down, find "Windows Time" service, right-click on it and select "Properties". 3. The above action will open the Windows Time properties window. Here, if the service is not running, you will see the "Start" button, click on it. This will start the service. Next, select "Automatic" from the drop-down menu next to "Startup type" and click on the "Apply" and "Ok" buttons to save changes. 4. Restart your system to apply the changes. 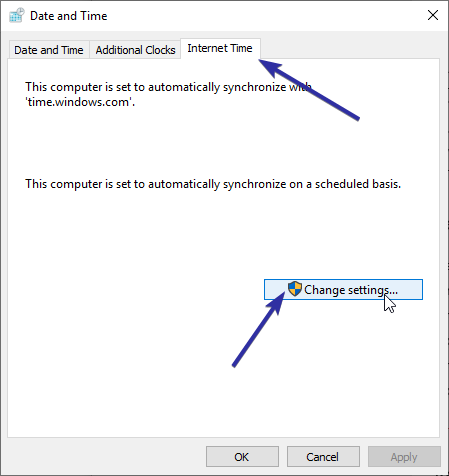 Windows has a neat little feature that lets you sync the time with the internet from accurate and reliable sources like time.windows.com or time.nist.gov. This feature is enabled by default. As such, as soon as you connect to the internet, Windows will correct the time automatically. Under certain circumstances, this feature might get disabled. If that's the case, you need to enable the internet time sync feature. 1. 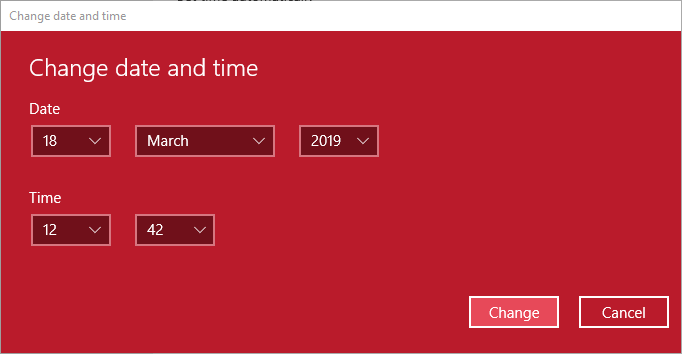 Search for Settings in the start menu and open the Settings app. You can also click on the "All Settings" button available in the notification center. 2. In the Settings app, go to "Time & Language -> Region". On the right panel, find the "Additional date, time & regional settings" link and click on it. 3. The above action will open the control panel window. Here, click on the "Set the time and date" link under Date and Time section. 4. In the Date and Time window, go to the "Internet Time" tab and click on the "Change settings" button. 5. 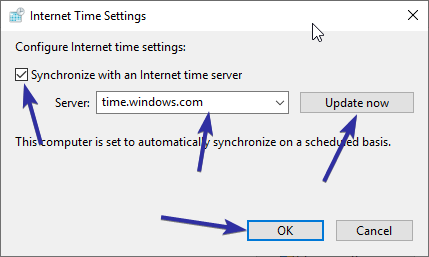 Now, select the "Synchronize with an Internet time server" checkbox, select time.windows.com or time.nist.gov from the dropdown menu and click on the "Update now" button. As soon as you click on the button, the time will be updated. Click on the "Ok" button to save changes. 6. Close all other windows. When the timezone is not right, the time will not be correct. 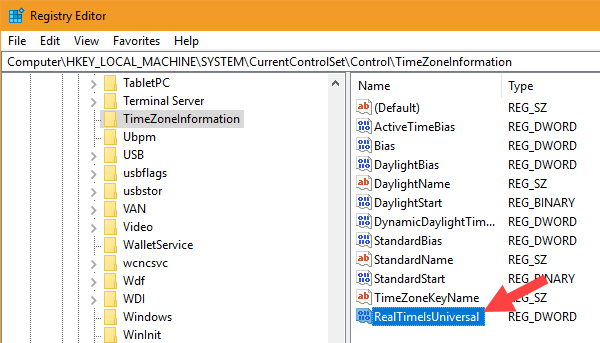 Generally, Windows can automatically detect the timezone and set it. However, it can be wrong sometimes or you might've changed it unintentionally. 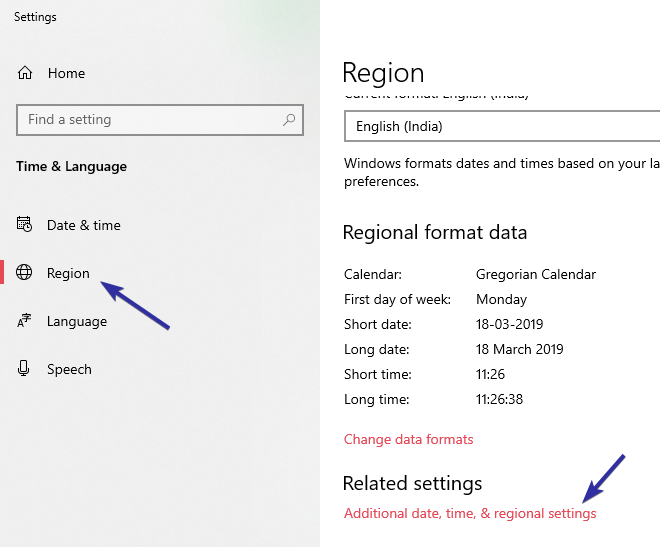 Follow these quick steps to change timezone to the proper location in Windows 10. If the automatic Windows time is wrong, you can set the time manually too. It is very easy to do. 2. In the Settings app, go to "Time & Language -> Date & Time" page. On the right-panel, toggle the switch under "Set time automatically" to the "Off" position. Next, click on the "Change" button under "Change date and time" section. 3. As soon as you click on the button, another window will open. Here, use the drop-down menus to set the time and date. Once you are satisfied, hit the "Change" button to confirm the changes. If you are dual booting Windows and Linux, then you might want to add the "RealTimeIsUniversal" value to your Registry. This is because Windows and Linux treat time differently. Windows assumes whatever time your motherboard tells it as the real time. On the other hand, Linux treats the time told by your motherboard as UTC (Greenwich Mean Time) and off-sets it according to your timezone. As you can tell, every time you boot into the other OS, the time will be modified which results in the wrong or incorrect time. I've already covered a detailed guide on how you can fix Windows and Linux showing a different time. Follow that guide and you should be good. Under certain circumstances, Windows gets confused and loses time synchronization. In those situations, you can re-sync the time using a simple PowerShell command. 1. 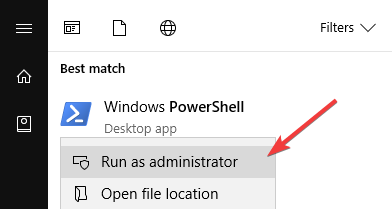 Open the start menu, search for "PowerShell", right click on it and select "Run as Administrator" option. 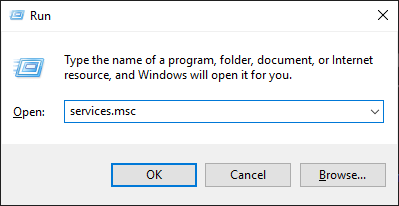 This action will open the PowerShell with admin rights. 2. In the blank PowerShell window, execute the below command. You can simply copy the command and right-click inside the PowerShell window to paste it. As soon as you execute the command, you should see the outputs "Sending resync command to local computer" and "The command completed successfully". Do keep in mind that if there is no internet connection, the command will not execute successfully. Certain viruses and malware can change the time without your notice or mess with Windows in such a way that it shows the wrong time. So, if the above methods didn't fix the Windows wrong time issue, you might want to scan your system for any infection. 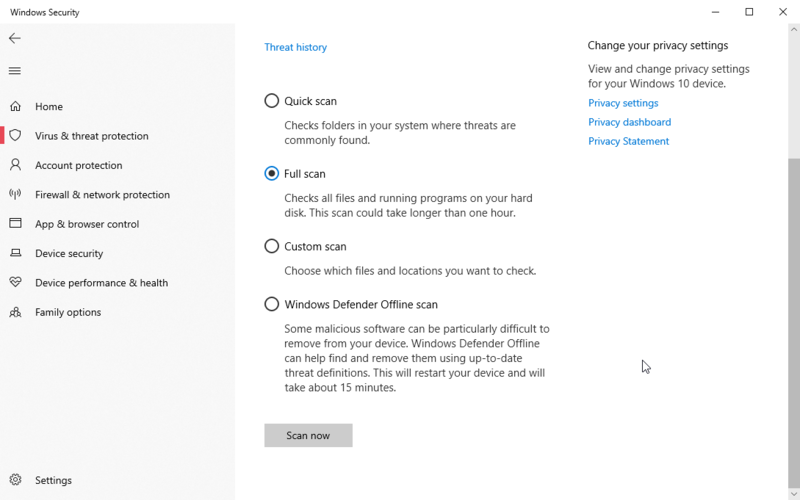 You can use Windows Defender or third-party antivirus software like Avast or AVG to perform a full system scan (not quick scan). Additionally, also use the Malwarebytes to do a full scan. Depending on how big your hard disk is and how many files you have, the scan can take a few hours. So, if possible, start the virus scan before you go to sleep. That way, it will be completed before you wake up and you don't have to lose any productive time. If the scan finds any threats, follow the appropriate steps shown in your antivirus application to clean the system and see if it fixes the issue. Every computer, even most laptops, has something called CMOS battery on its motherboard. One of the primary functions of this battery is to help the system keep track of the time even when it is turned off. This is the reason why even when you turned off and unplugged the computer for weeks at a time, it can show the correct time after restarting. If the CMOS battery is faulty, it can no longer help the motherboard keep track of time. As a result, every time you start your system you will see the wrong time. By simply resetting or replacing the CMOS battery, you can solve the wrong time issue. 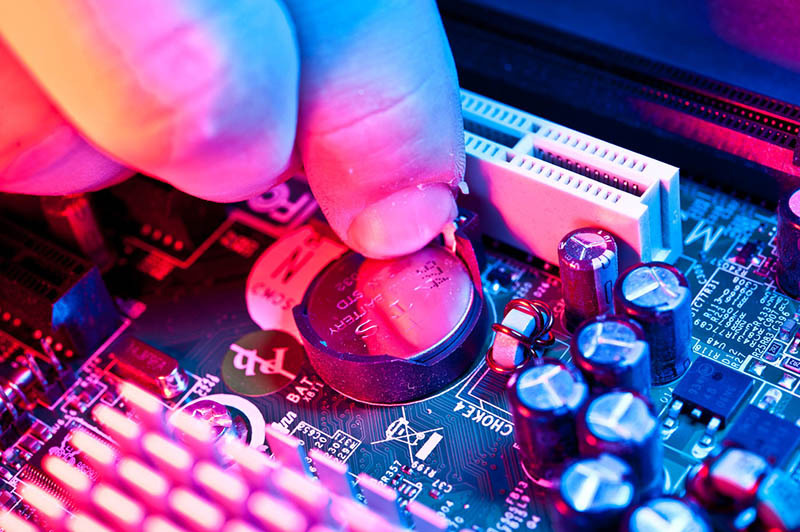 More often than not, your motherboard manual should contain the steps to reset or replace the CMOS battery. If not, there are quite a few YouTube tutorials showing how you can do it yourself. Follow any one of those guides and you should be good. On laptops, it can be a bit tricky. Generally, you can find the official repair manual for your specific laptop model on the internet. If you are comfortable repairing your own electronics, follow the repair manual. Otherwise, I'd recommend you to take it to the first-party or third-party repair service center.